Who would’ve thought that one of the admins in charge of the Microsoft Store Twitter is a Once. It started with a Twitter user commenting on the teaser comeback photo of the K-pop girl group. Another user then comments that the photo looks like it was made in Microsoft Paint which prompts the Microsoft Store to ask if there’s a problem with that. Then another Twice fan randomly asks the Microsoft Store to stan Twice. Adding a picture of Jihyo dancing in a KBS show. But no one including the Twice fan, didn’t expect the Microsoft Store to know who Jihyo is. Microsoft even praised her dancing skills adding that she was killin’ it. 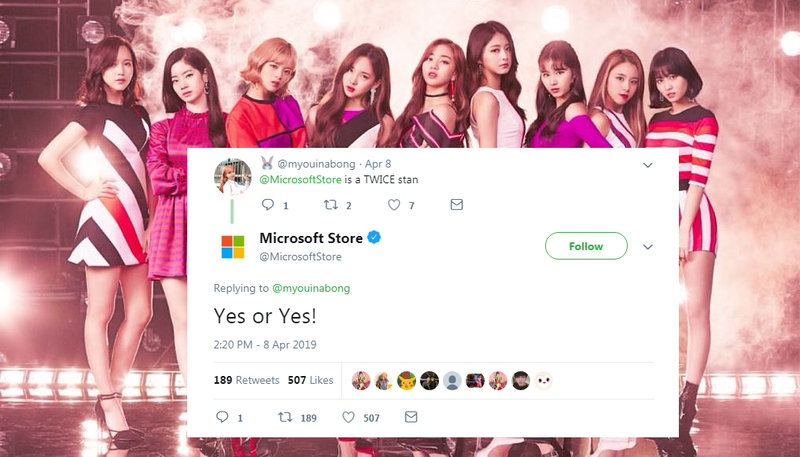 And in a series of Tweets, the Microsoft Store proves even more that they are indeed a Twice Stan. They even cleverly add references of Twice’s songs in their Tweets. We do likey likey Likey. So who’s their bias? It looks like Microsoft likes them all!